Theresa Peterson is a Registered Dental Hygienist with Langworthy Family Dental. Theresa graduated from NICC’s dental assisting program in 2007 and began working at Langworthy as an assistant shortly after. In 2011, Theresa graduated from Hawkeye Community College’s dental hygiene program and has been working as a hygienist at Langworthy ever since. 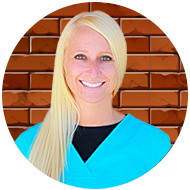 She enjoys helping people with their overall health and hygiene, and is motivated by seeing her patient’s smiles improve! While not working, Theresa spends much of her time running, practicing yoga, watching the Iowa Hawkeyes, and spending time with her two nieces. Theresa resides in Peosta, Iowa with her husband, Jake and their two dogs Rambo and Ringo.